I think they’re selling it by the pound. As far as I can guess, somewhere behind the swinging doors of the mysterious ‘Employees Only’ area is a giant, roiling pit, filled with Christmas things. From this pit, the employees pack shovels-ful of Christmas into very large, clear plastic blanket bags. If you have x-ray vision, it’s possible to see one of everything ever remotely related to Christmas, across many decades of décor, crammed into these bags which are then dumped onto the sales floor and left to fend for themselves. And there I am, pawing my way through one of these bags, which is clearly marked "Do Not Open, except for you, Amy," and what do I find buried in the midst of the tangled tinsel, plastic holly and strings of burned out lights? Somehow both ornaments remained completely intact despite having been (possibly) shoveled from a pit into a bag. Could this be a Christmas miracle? I think so. But what really caught me by surprise in that bag were these. 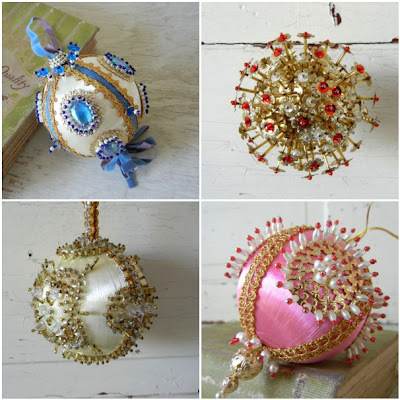 I can’t begin to imagine the number of hours and finger pricks it took to create these pins + beads + sequins ornaments and to me, they are shiny, tacky, gaudy, beautiful, flashy, flawless handmade treasures. That’s right. I’ve gone to a place I never thought I’d go: The world of sequins. Ooohh. Ooohh. Ooohh. The Christmas Pixies were smiling on you when you found that bag of treasure. Beautiful, lucky, goodie-goodie. Sequin intervention: I have never felt such pressure, nor so helpless. I'm listening to my inner Nancy Reagan (and trust me, that's how desperate I am to help you): Just say no. Ah, Amy! My mom and I made those pin and sequin type of ornaments when I was a child. I inherited them when she passed but all the pins kept falling out until I had a real mess on my hands! I kept them in a big bag for years, thinking I'd somehow redo them on new balls but no, year after year went by and I finally got rid of them. They just made me sad to see them falling apart! Those ones you found look like they are from the same era but maybe better styrofoam since they are intact??? I am a sucker for those bags.There is always some vintage treasure floating around in it.I am less of sucker for them now that they've jacked the price of the bags up to $20 each though!I have a bunch of those sequin ornaments that my grandmother made a million years ago.I find them delightfully tacky!Enjoy! I love a good Christmas Miracle. Those glass ornaments are so great!!! Those sequin/pin ornaments crack me up. My mom and grandmother made those and I just (coincidentally) sorted through them at my mom's today. They are so funny, but cool at the same time. Wishing you many more Christmas Miracles this season!! Oh....I know what you mean! Our thrift store does the same thing.....I just grab the bags and buy them all and then sort through when I get home, oh what treasures are to be found! You found some great ones.....like a real treasure hunt! Carry on my blogging friend! lol! There is no such thing as too much tacky wonderful glittery sequined wonderfulness!!! I made not only ornaments like that but entire styrofoam trees when I was in Camp Fire Girls! I still do actually but I use vintage buttons now. I'll be digging out the sequins I have stashed! I also love those kitschy sequinned ornaments! I've got a set of three LARGE red ones that I display on chunky candleholders of various heights. Shine on! I love sequins. Those glass ornaments are delightful. And yeah, I really am commenting at 5:21 am. So many Plucky thoughts in my head, that they're keeping me from my precious sleep! I'm laughing imagining about the giant Christmas pit in the employees only area. I think you got a good shovel full! Christmas Nightmare Flashbacks! As kids my sister and I made those sequin ornaments for YEARS. You wouldn't enjoy them today if you'd spent countless weekends holed up in a stuffy house crafting your fingers bloody. But enjoy! I noticed this disturbing trend at our Goodwill too. Tons of stuff sandwiched into clear plastic bags, so that you have to spend valuable minutes turning the bag over and over to see what's inside! Unfortunately what's inside should have just been thrown out. I remember my sister making tons of those sequin-y ornaments back in the 70s. They do have their own tacky charm, don't they?! My mom used to make those sequined ornies, so they have a special place in my memory. The pink one I remember very well. I saw a few recently and the hub thought they were pin cushions. I have to brag that my fave thrift turned the entire front half of the store into a Christmas room. Then stocked it with about a hundred questionably smelling 'vintage' wax deer air fresheners from the 80's. Still, other than smelling like someone else's grandma, awesome. When I grow up I want a thrift store just like yours nearby.....Those ornaments, expecially the tea pot, are a wonderful find. Can't believe they stayed in one piece. That last ornament with the gold and red sequins reminds me of the pin you use for your logo. Just 2 years ago, I would have considered this sooooo tacky. But ever since my eyes have been opened to the wonderful world of vintage, I just love it! I'd also love to be a follower! EXTREMELY lucky to find those 2 figural glass ornaments in tact! I went thrifting this weekend and only managed to find one box worthy of me buying. So many others were overpriced, or many broken ones. This is the only time of the year that I would like to work at Goodwill and do some shoveling in that pit you talk about (which I am sure exists). I have the sequin bug...my first sequin ornament was created from a kit in second grade and still hangs on my tree. Proudly. Help is on its way, but that's not such a bad place to be. Wow! I've never seen anything like those tea pot ornaments before. I'm shocked that they weren't in bits and pieces stuck to the felt candy canes. I found a box of those hand made ornaments a few years ago....now I'm wondering where I put them. You are just tooooo lucky!! Great finds and great timing!!! Score!! It was a bust for me. That's Ok! Still more time to hunt for Xmas past. Lucky Girl! Send me some luck please. Ha, Ha. Isn't it totally amazing that extremely fragile things like those fab ornaments make it thru the thrifts without being broken into a zillion pieces? I think you were meant to have them. I'm not too proud to admit I dug one of those sequined ornaments (I LOVE them) out of a bag of other Christmas dreck at my local Goodwill and snuck it into another bag of Christmas stuff that I purchased. Very cute tea pot ornie! It's frustrating at these thrift stores...prices are up, too many "dealer's" buying (me too) and then this..
Maybe it will make you feel better to know coppertonlane.com has sequin ornies for $12 to $26! Good find. Wear a mask and put em in your booth quickly to avoid contracting "sequinitis"! Golly Amy - you lead a charmed thrifting life! Those little ornies are adorable, and must have at least nine lives to have survived the back room. I know they'll live happily ever after at the Into Vintage Home For Wayward Christmas Ornaments. What a treasure. A little teapot ornament. Amy, you brought back wonderful and funny memories of Christmases past for me -- my Mother went through a phase of making those ornaments. She called them "Sputnik" balls... now you can identify how old I am!!! I have a few of them, and yes, they took hours and fingertips were sore as heck afterward. How very sad that these were dumped so unceremoniously. but how wonderful that you rescued them...and I am sure will cherish the handiwork of someone you will never meet, except in spirit. Haha! I am a yarn collector and just put and "oops" finger poke through those bags to feel the fiber or adjust the tag to see the content and yardage. My thrift store is doing that too. Huge bags crammed with Christmas stuff and you can't figure out what's in there. But, now that I know there might be cool sequined ornaments in there I might have to spring for one of the bags. oh my heart and soul. It really IS a Christmas miracle! I've never seen anything like them, but I am smitten. 3 - Made By Someone With Way Too Much Time On Their Hands. Oh my gosh, I don't know how I missed this. Well yes, I do. I had a houseguest. The plethora of Christmas cast-offs must have known those ornaments were special and snuggled up to protect them. Great score! Warning. This one's a rambler.